I’ll be honest, South Africa was a place that I never thought I’d go to. Not because of the distance, but I hadn’t heard good things about it. There are so many stigmas attached to the place, the main one being that it’s unsafe. I’d be lying if I said this wasn’t something I thought. But I am so glad I took the ‘risk’ because it is one of the most beautiful places I have ever been to. Here’s 10 things you need to do while you’re there. If you read my tips on what to do in New York, you’ll know how much I love these things. So I’m going to kick off this top 10 in exactly the same style. 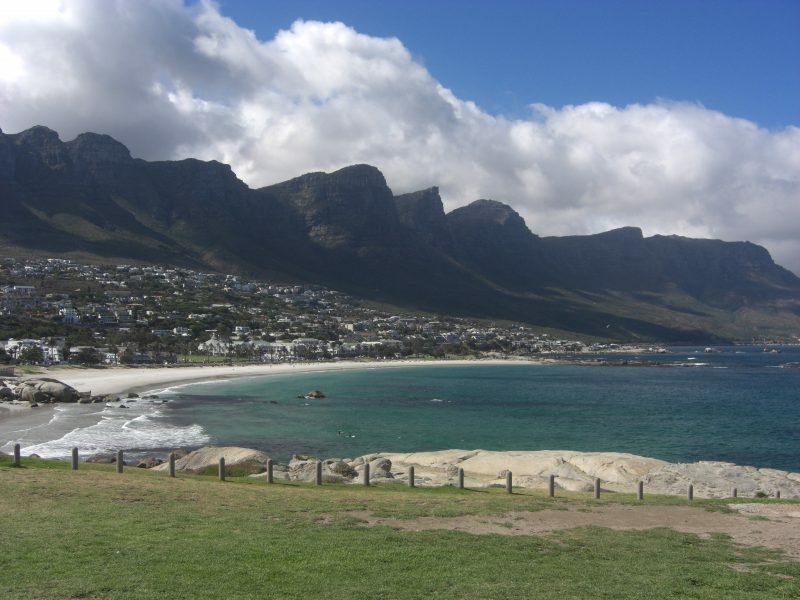 Although my hotel was fairly central to most things, this was a great way to go that bit further out and to see some of the other things Cape Town had to offer. From the Winchester Mansions on the beach front (actually a hotel not mansions but it is as luxurious as it sounds), to the Cape Town stadium where the 2010 Fifa World Cup was held. This place has everything. Grocery stores, a shopping mall and an endless choice of restaurants. 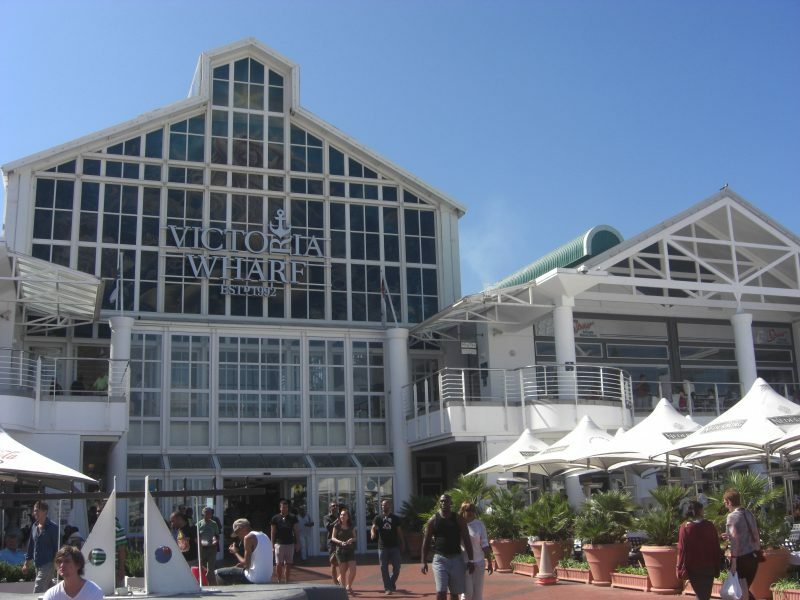 I stayed about 10 minutes from here and had a shuttle bus from the hotel directly to V&A. Be sure to visit in both day and night to see everything that goes on here. They do recommend that you take public transport to most places instead of walking as there are some no-go areas. All you’ve got to do it use your head. You wouldn’t walk alone down quiet alleys at home, so don’t do it when you’re abroad either. You’ll see plenty of bands and choirs and you may think ‘once you’ve seen one you’ve seen them all’. Then you’re wrong. Seriously, you should stop and listen to them. 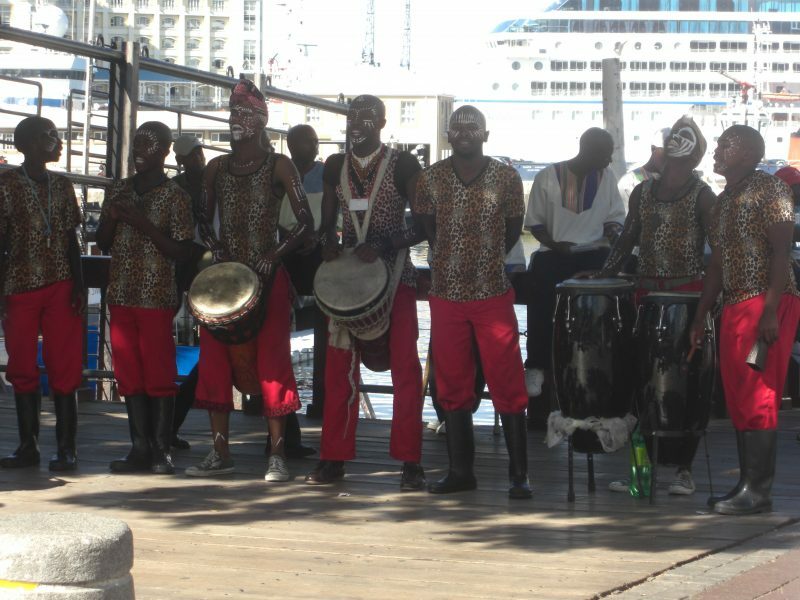 The South African choirs and street performers are throughout the V&A waterfront and each one you see is different. Don’t just walk past them, you’ll miss out otherwise. Most of them have CDs of their music and rely on tips as most street performers do. If you’ve got some extra change, they’ll be so grateful to receive anything you can give – no matter how small it is. I can also recommend going on this. 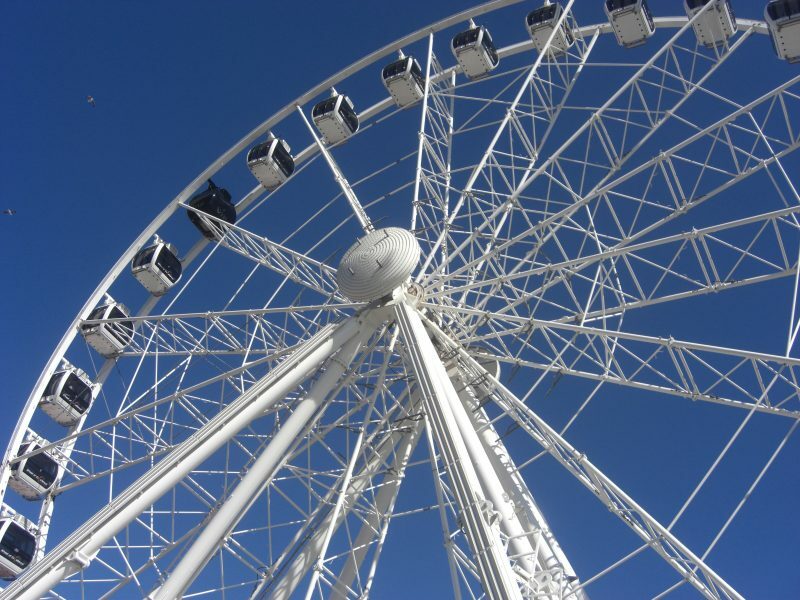 It’s kind of like the London Eye but on a smaller scale. On a clear day, you’ll see far and wide across the waterfront. 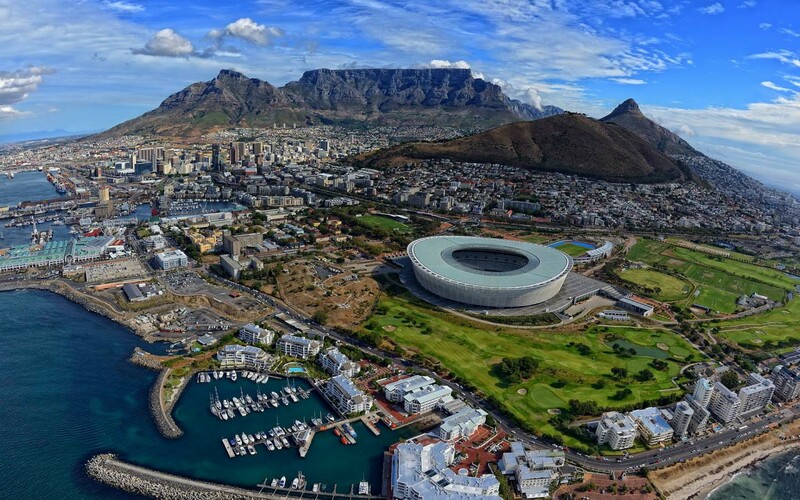 Look down at all the action below and get some pretty awesome photos of table mountain too. This is one magnificent mountain. The cable car that takes you to the top is a 360-degree view one. What I mean by that is, the floor moves. Crazy right? I’ve never been in anything quite like it. Basically, it gives everyone the chance to see the same views in turn. No need to fight your way to a particular spot for the best views. When you reach the top, the views are even more spectacular. If you’re scared of heights this might not be advisable. 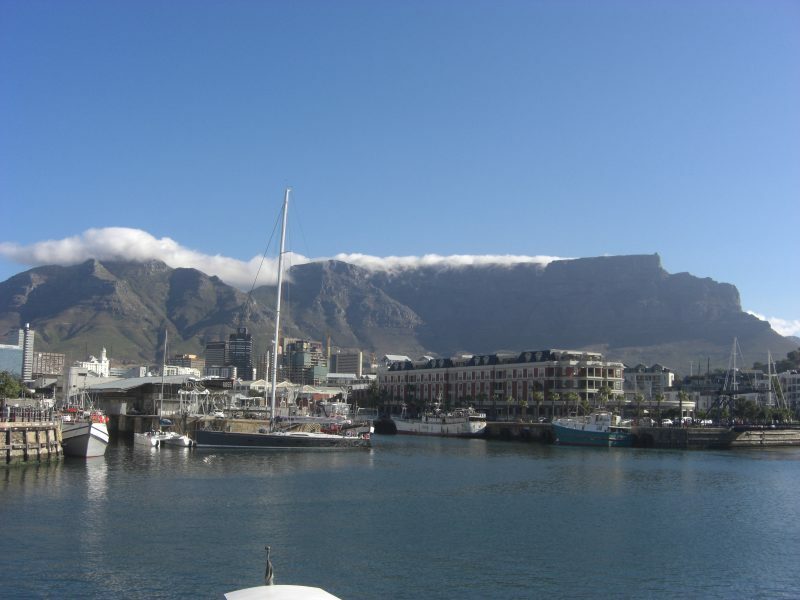 You’ll get some pretty awesome views and photos like this one I took from the V&A waterfront. 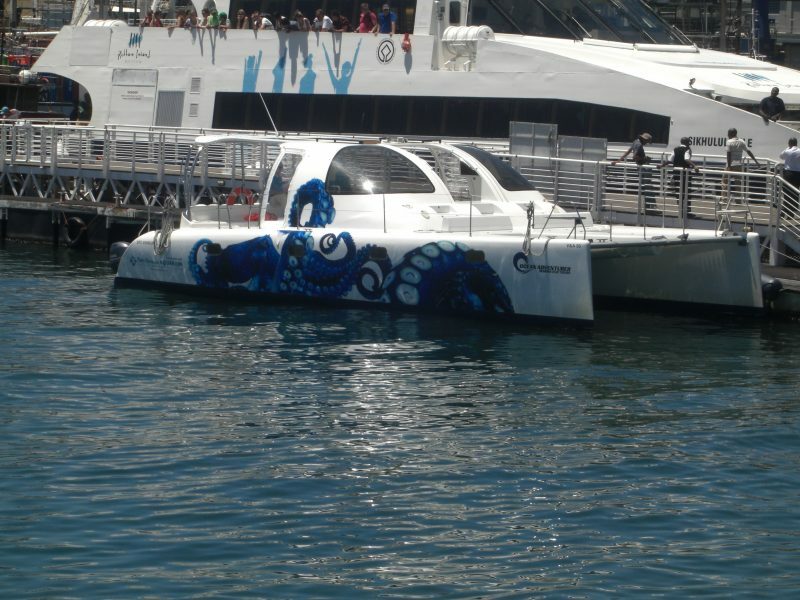 This boat ride was…an experience! Apart from getting severe wind burn, I got to see loads of dolphins. Of course, they went under the water as soon as my camera was able to capture them. If you get sea sick though, this won’t be for you. It does get pretty bumpy. By the way, what we went on was the smaller of the two boats. The one alongside it is the one you take to Robben Island. 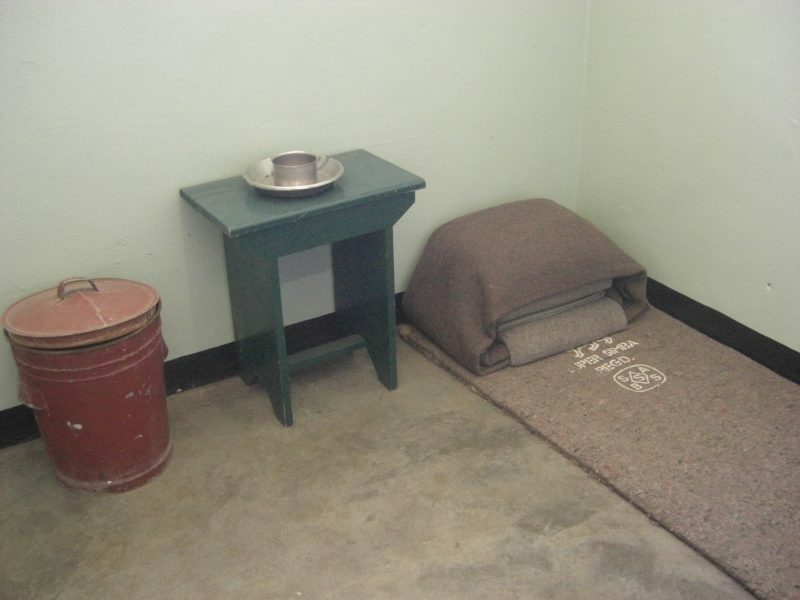 This is the island that Nelson Mandela spent 18 years of his 27-year prison sentence in jail. If you’re interested in seeing where he spent his time and learning about its history – go! I promise you it’s not boring. The guide who showed us around was an actual prisoner there at the same time as Mandela. These experiences are priceless. Yas wine! South Africa is known for its delicious wine and on one of these trips you’ll get to sample some of the best. 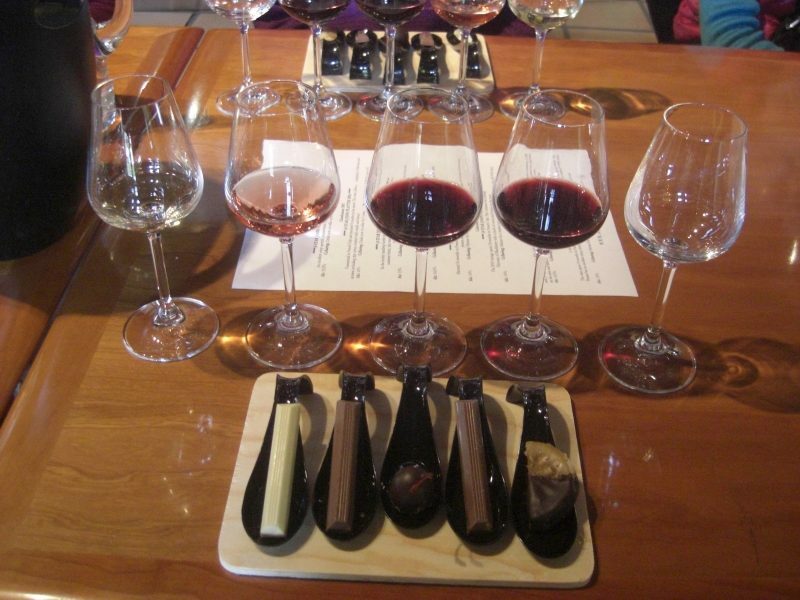 On the trip I went on, they gave certain cheeses (yuck) and chocolates (yum) that compliment the taste of the wine. The trip started at 9.30am. Needless to say, I was a bit tipsy by 1pm so make sure you have a decent breakfast before you go. I think I might have been doing it wrong though as most people were swilling the wine in their mouths and spitting it out. I was drinking the wine obviously. Not going to waste wine am I? The most beautiful beach I have ever seen. The sea so blue and the sand so white. Although I didn’t actually go on the beach itself (not a beach fan), I loved watching people surfing and enjoyed looking at the views. Listening to the waves and taking in the sea air is so relaxing. Penguins on a beach. No, this image hasn’t been photoshopped and it’s not a hoax. 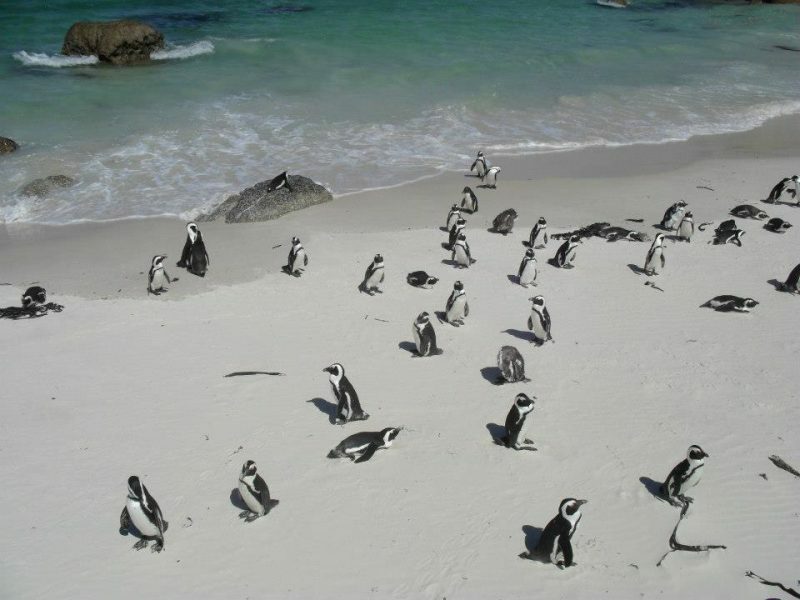 Probably the only place you’ll ever see penguins on a beach. You have to see it to believe it. Most people associate penguins with cold countries, but these guys were loving life in the sun in 30-degree heat. 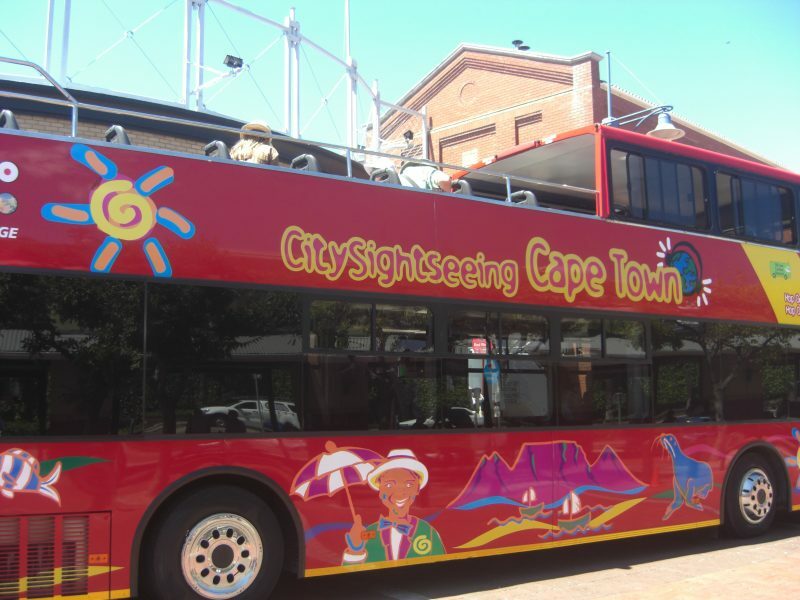 So there you go, there’s guide of what to do in Cape Town. You may be wondering why I haven’t included a safari in this. It’s because I didn’t go on one. So I went to South Africa and didn’t go on a safari, crazy I know. There were 2 reasons why. 1 – I am not a morning person and the tour started at 5:30am. 2 – Not long before I went, two British people were attacked by a rhino, one guy died and the woman’s lung got punctured by its horn. You can understand my reservations because of the latter I’m sure. 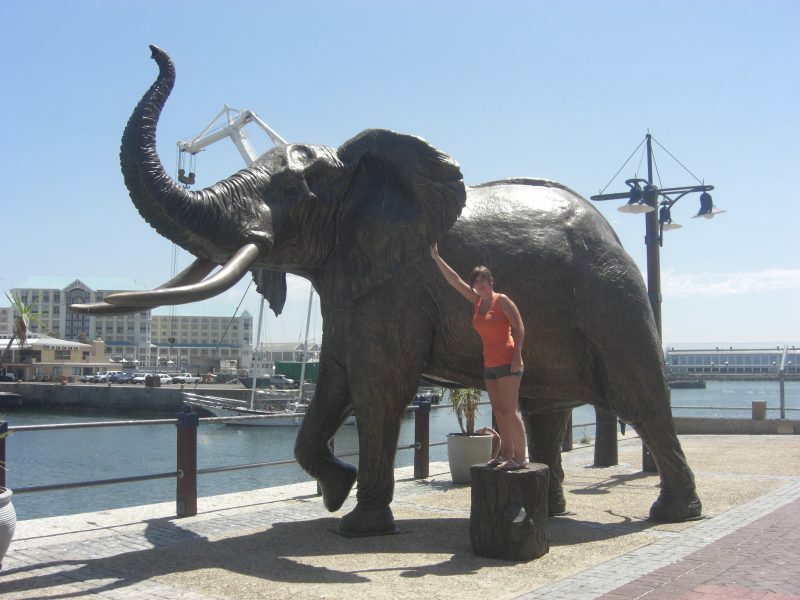 The closest I got to any wildlife were the penguins in Boulders, oh yeah and this awesome elephant statue albeit not real. Put it this way, I would not hesitate going here again. I’m thinking maybe trying Durban for a few days and then back to Cape Town. Who knows, maybe I’ll be brave enough to go on safari and diving with the sharks next.